The Scythe Katana is back with a new, more efficient design, better cooling and now it's also LGA2011 compatible. The spirit of the Japanese sword inspired the naming of the famous CPU Cooler Katana. Well known for its reliability and its tilted fin structure the Katana 4, just like the Japanese sword, looks back on a long tradition. The fourth generation stands out with its new modern design combining key features of previous versions with design and efficiency improvements. The low height as well as the structure of the fins and the use of three U-shaped heatpipes are adopted from its predecessors. In addition, the new design lays the foundation for higher cooling performance by providing a larger cooling surface. The Katana 4 is supplied with a 92mm Slip Stream PWM fan. This combination enables a virtually silent mode of operation as well as being able to accommodate overclockers. Higher cooling performance is one of the characteristics of fourth generation Katana CPU cooler. The combination of three U-shaped heatpipes, large fins and a PWM-controlled Slip Stream 92 mm fan ensures high-scale heat dissipation. A slightly angled fin structure, allows the airstream to hit the surface directly. The overall surface of the heatsink has been increased. As is common practice for all Scythe products, the Katana 4 provides maximum compatibility with a wide range of sockets. All current sockets are supported. Furthermore, a new generation one-touch clip system is launched with Katana 4 excelling in user friendliness and durability. the Katana 4 has a completely new design providing a new, modern look. The fan is situated right-angled to the motherboard and fins are tilted downward. 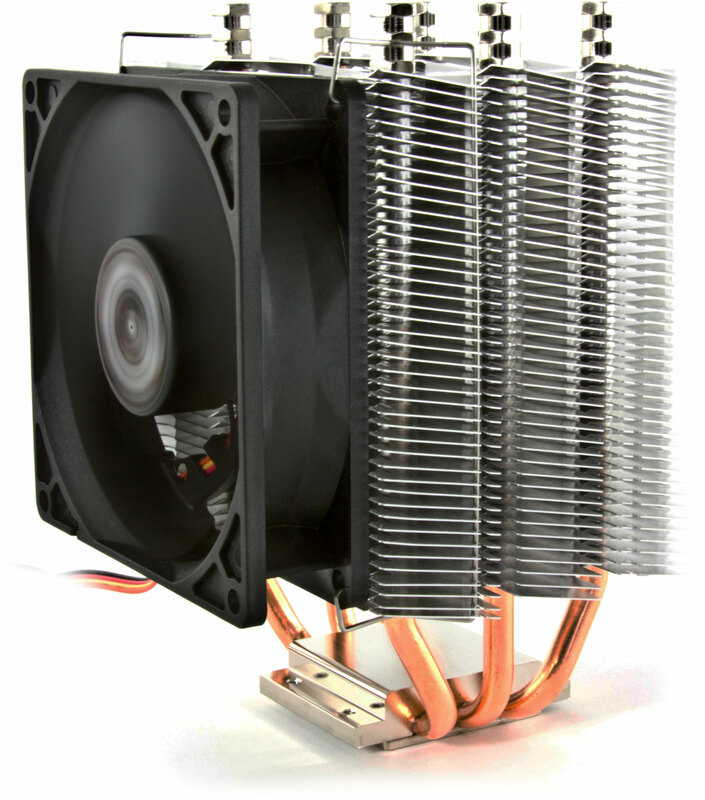 Heatsink and Heatpipes are completely redesigned. Optical enhancements go hand in hand with practical improvements and better cooling performance is one of them. The basis of the new design originates in one simple question - How to build a new, modern looking Katana-style CPU cooler, without sacrificing the compact dimensions of its predecessor? The Katana 4 brings this idea into reality. The measurements are very similar to the compact Katana 3, allowing as before the use of the cooler in limited space enclosures. A surprisingly light cooler. I think the fan weighs more than the cooler itself. Replacing a stock Intel cooler that I managed to break a fan blade on. I liked the sideways airflow set up as I have a through and through NZXT 'Hush' case, so the Katana lined up just right. Fitting, found it less simple than the instructions implied, but once I'd set the push pins up right it was fairly simple to seat it all in place. Operation, had to double check the fan was working as it was so quiet !! It's been installed a couple of weeks now, CPU temps are 40°-45° well within my i7's comfort zone. Excellent value for money !! If you haven't got room for a huge cooler or are concerned about hanging something heavy off the motherboard, the Katana 4 is a good option to consider. Quiet PC gave me top class advice and service all the way through. I can't thank them enough for that. A point of information for all. If you have an Asus P6X58D-E motherboard, there is a large plate on the back that will prevent many coolers with back plate fittings from seating down !! Be warned !! I was using a stock AMD cooler before (three or four years), which was just not up to the job. During the summer, the noise alone was a clear indication the PC was running much too hot. But when a noise was indicating a failing fan, it was only the use of CPUID HWMonitor which told me how hot the processor was getting -- typical temperature was 77C (after replacing case fans with two Nanoxias). After installing this, the typical temperature has dropped to 33C, and runs much quieter. Finally the PWM fan isn't running at 100% all the time, and I may even reduce the speed of the non-PWM fan with the 7-volt adaptor. I am just using the included thermal paste. Make sure to have some isopropanol to hand so you can clean off the old thermal paste before applying the new paste. On AMD systems, the cooler can only be used in one of two ways. The first so that the fan blows the hot air across the motherboard (which you obviously don't want), or the second up to the top of the case. If you have an AMD processor, and don't have a top exhaust on your case, then this isn't the cooler for you. With Scythe's mounting clips, it's good to know that if in future I change from an AMD system to an Intel system, I wont necessarily need a new CPU cooler. The cooler was in the main very easy to install, without the need to remove the motherboard. The trickiest part is that the cooler fan needs to be removed to give access to the motherboard mounting clips, and putting the fan back on once the cooler is mounted can be frustrating. I found grunting a lot, and swearing, to help. System details: AMD Phenom II X4 955, Gigabyte MA790GPT-UD3H motherboard, Hiper Osiris case. Also, this was my first order from Quiet PC. Brilliant, super-fast service. 5 stars for both the cooler, and Quiet PC.